Maine is behind us and we are hitting the Whites! 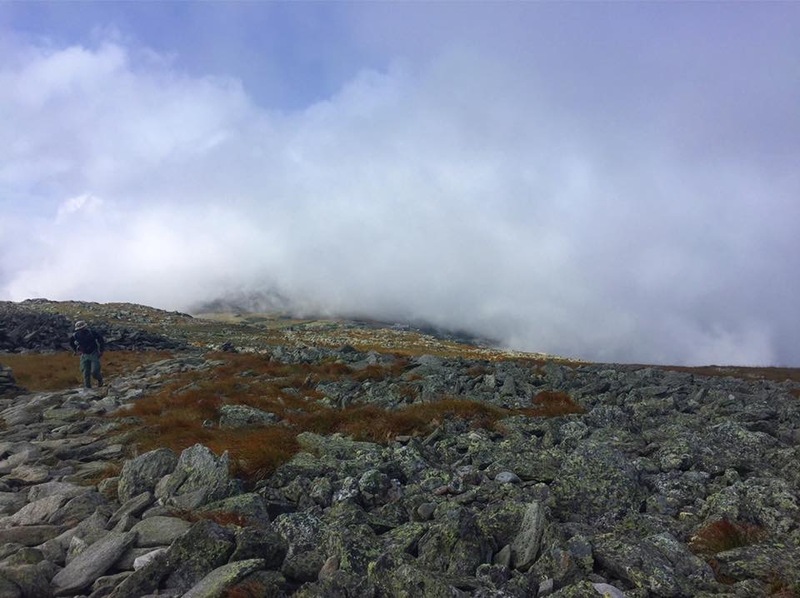 I will be tackling my arch nemesis, Mount Madison and Mount Washington welcomes me home with her typical foggy, windy, rainy welcome. 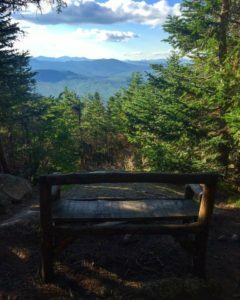 This week’s stories of my travels on the AT! Since we declined Dad’s offer to pay for a hotel room for us last night in Gorham, NH, he insisted on doing that for us today. Horay! We have an actual bed for the night! So we quickly packed our gear, made sure our tents were dry, and were ready to make our move to the hotel. What an excellent early birthday gift! My parents picked us up for breakfast and took us to the hotel. I ate an entire plate of pancakes. My parents were shocked! I don’t believe they have ever seen me clean a plate before. Because . . . hiker hunger! Once we completed our meal, as we were discussing what to do next, we saw Gray walking down the sidewalk. “Dad, that’s Gray!” I pointed out. Gray stopped and looked both directions, seeing no one he recognized. So I rushed to the enterance and waved to Gray. He smiled, now recognizing who was behind the voice of God calling his name, and he sauntered into the restaurant to meet my family. Emily and Tree received the same treatment, both looking confused, Tree spinning and putting his hand to his ear like Hulk Hogan, until I surfaced around the corner. Trail Family, meet Real Family! It was great to finally get the two together! Everyone joked and laughed for a little while and then we all went back to the hotel. Once we were all settled in our hotel room, my parents packed their belongings and bid us a long farwell. It was hard to say goodbye, but they left to return to their vacation at the lake and we were off to continue our adventures on the trail the following day. It was a great visit with lots of wonderful surprises! Tonight, we planned on having our last Trail Family dinner. Tomorrow, Gray, Emily, and Tree will be driving around Maine to site see and visit different towns. They will continue on the trail after thier detore, but they will remain 6 days behind us. So today, Gray and Emily picked up their rental car, and carted us around to run some errands. Then we all went to a restaurant for our last Trail Family dinner. We were joined by Weebles, Chef Ducky, Lady Bird, and Kiwasabi as well. After a delicious dinner, we all made a trip to the hot tub. Soaking all our aches and pains, we chatted and joked for a while. “Hey, do you guys still want to do ice cream tonight?” Tree asked us as we soaked in the hot water. “Ice Cream!” We all shouted, jumping out of the hot tub and going to grab our towels to dry off and change. What an adventure to get ice cream that night! The ice cream parlor, was open until 10pm, but at 9:30, the girl behind the register snootly informed us she was closed. Huh, ok. So off to go on an ice cream hunt we were. We finally ended at McDonald’s for McFlurries. Not the best, but we did eventually get our ice cream fill. Who would have thought it’d be so challenging to get ice cream! After our adventure of ice cream hunting, we retired to our nice, cool, comforable hotel room, snuggled in our beds, and slept peacefully for the night. Today our Trail Family will go our seperate ways, at least for a short period of time. Gray and Emily gave us a ride to the trail head today. They start their tour de Maine later today. 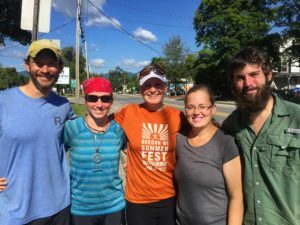 So our little trail family sadly split ways. 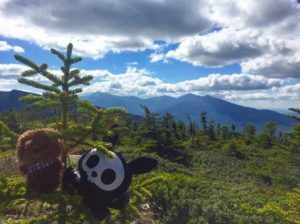 We may not see Tree again on the trail since he plans to end this section of his trip after the Whites. Gray and Emily may catch us again before they end their thru-hike in Harper’s Ferry, Virginia. We hope so. We all embraced goodbye, had one last picture, then Free Bird and I continued on our adventures, sadly alone, but eager to be on the trail once again. Regardless, our trail family will stay in touch and will always be welcome for a visit! Once a Trail Family member, always a Trail Family member! The Trail Family before we all part ways. As we begin our journey today, I was feeling fine. But shortly into our trip, something started to feel wrong. Not quite sure what it was. My pace quickly slowed as I started to wonder if I needed to stop and turn back down the mountain. I slowly plodded on, finally determining I mIgbo have had WAY too much coffee this morning, and eventually started to feel better. Phew! Feeling much better, Free Bird and I summited Mount Moriah and crossed the 300 mile mark! The critters sitting at the top of Mt Moriah. 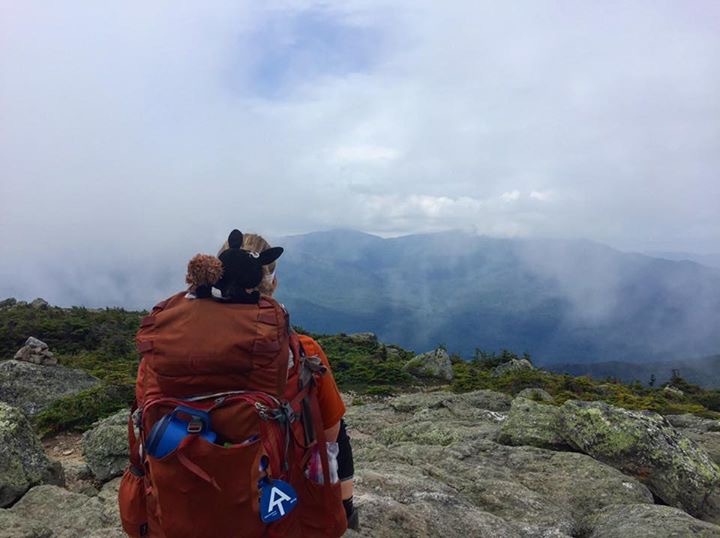 Me and my ridiculous missile of a pack on the top of Mt Moriah. As we reached the end of our day, we arrived at the Imp Campground. Michelle, the caretaker of the campsite, happily greated us and chatted with us for a while. We set up camp, stuffing both our tents on a small tent platform, cooked dinner with other campers at the designated cooking spot, placed all itens with a scent in the bear box, and retired for the evening. One day closer to the forboading Presidential Range! 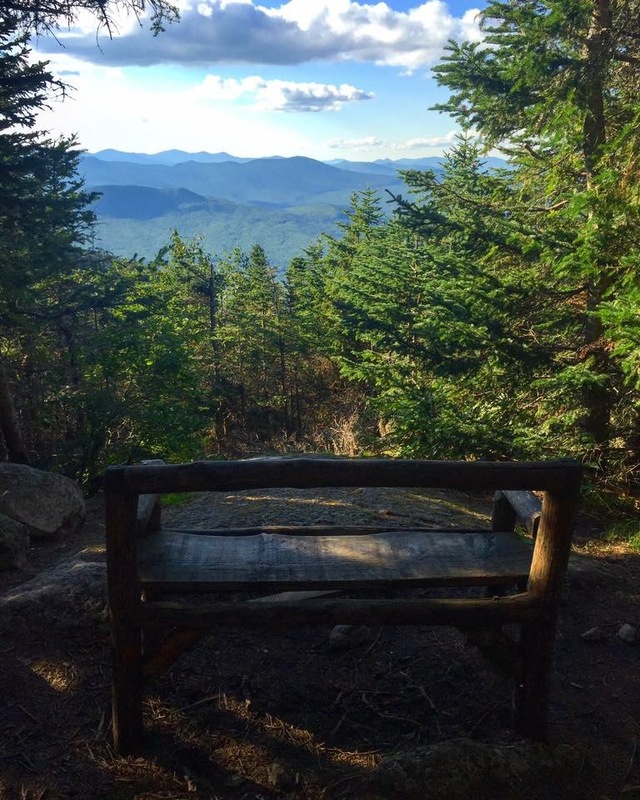 A really nice bench overlooking a great view at the Imp Campground. 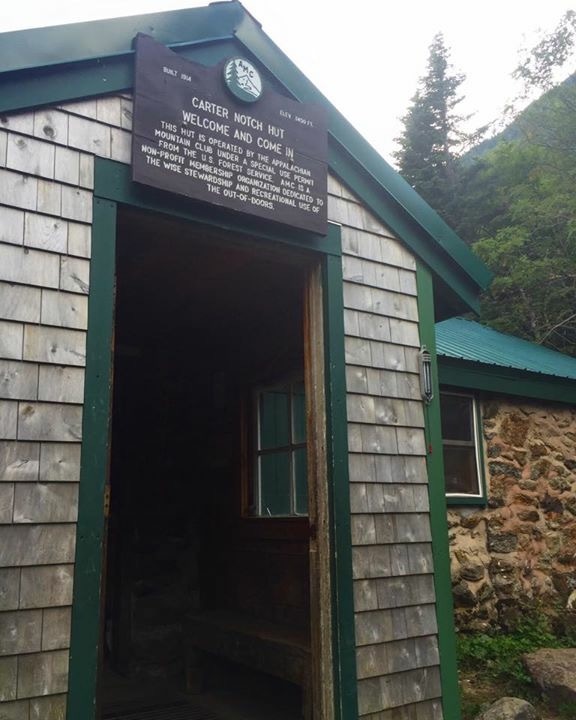 Today we head to our first New Hampshire hut; Carter Notch Hut. Normally, people that hike to these huts pay a large amount of money to stay there. However, as a thru-hiker, it is near impossible to plan that far in advance so you are left with one option; to try a work-for-stay. 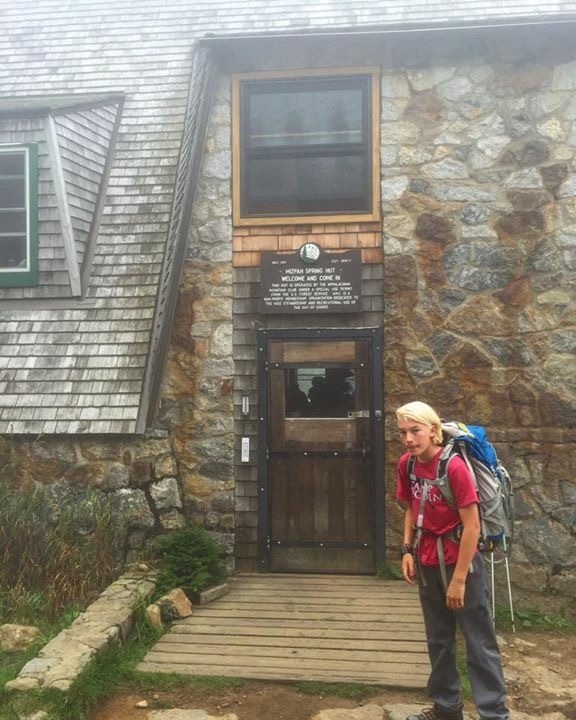 So most thru-hikers do their best to time their arrival at the hut. Why? Because if you get there too early, the croo will tell you to push on to the next location. Too late, and the hut may have all the work-for-stays they can handle. So it becomes an Amazing Race kind of scenario as we all race to the huts. For us, we had to CRAWL to get to Carter Notch Hut around 3:30-4pm; the perfect time to get accepted for a work-for-stay, if you are lucky! We had a couple that was also south bounding ahead of us trying to do the same thing as us. So all day, we played hop scotch with Moose Tracker and Mr Bisquick. At each mountain top and view, Free Bird and I would stop and have an elongated snack break, keeping an eye on our watches, trying to kill time. Oh brother! This is going to be a LONG day! We were going to fast! We had to kill more time! 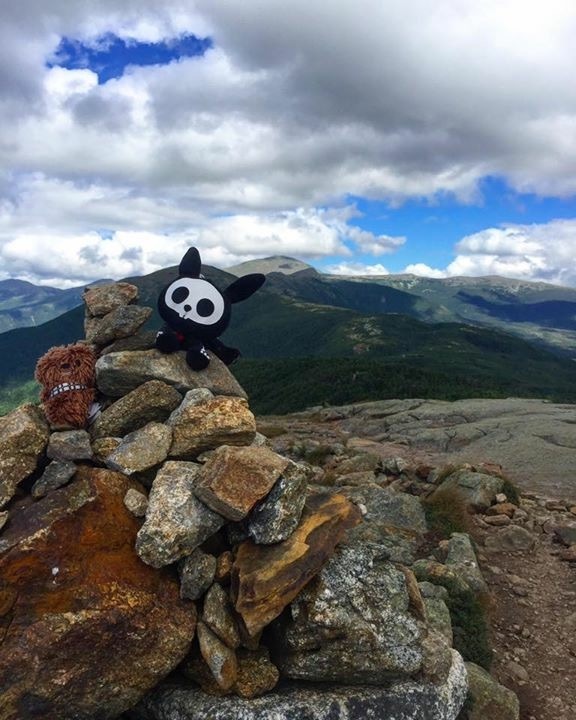 Since we had so much time to kill, we were able to take in all the beautiful views on the mountain tops and chat with all the people we passed and played hop scotch with. Free Bird and my critters having a moment on the top of North Carter Mountain. Madison Mountain (right) and Mount Washington (left) getting closer, begging me to continue on. The critters and Free Bird summit Middle Carter Mountain. 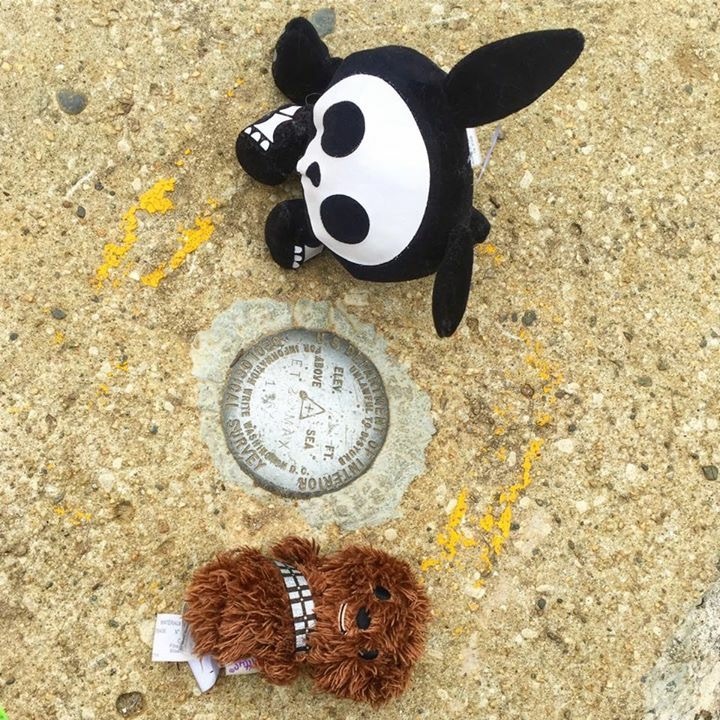 With no view at the top of Carter Dome, the critters did a photo shoot by the surveyer marker. We chatted with two women who were weekend hiking and a couple from Massachusetts that was also section hiking, Megan and Alex. We later dubbed them the Celtic couple, giving them their trail name. Both groups of people were wonderful and we really enjoyed having the time to get to know them! 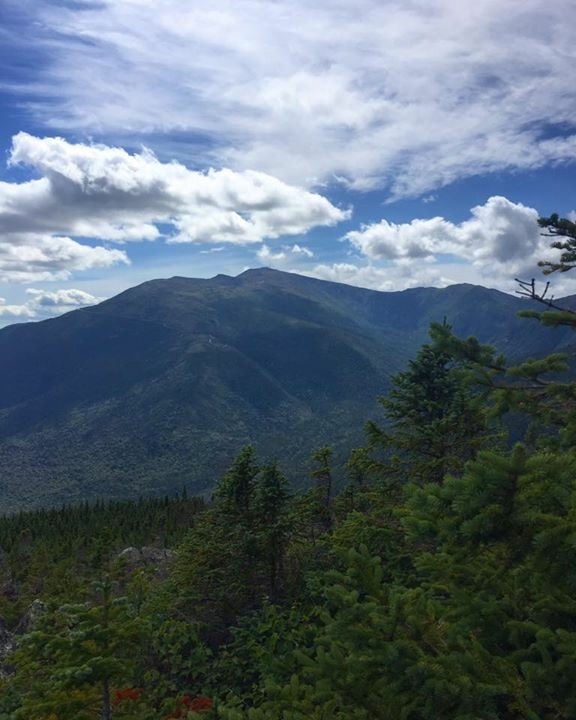 View of the Carter Mountains from Carter Notch Hut. As time crept towards 4pm, we started to get close to the hut. Moose Tracker and Mr Bisquick were directly ahead of us as all four of us pressed on towards the hut. They went in first, and got their work-for-stay. We followed right after and also got accepted! WHOOOHOOO!! Our first successful work-for-stay! Later, some flipfloppers joined us and were also accepted. That night, there would be 8 of us (Library, Rainbow, Captain Planet, Moose Tracker, Mr Bisquick, Free Bird and myself) sleeping on the hut floor after a hard days hiking and work at the hut! Weebles joined us for the work-for-stay as well that evening! What a great, welcoming, croo at Carter Notch! Thank you so much for allowing us to take shelter from the coming thunderstorms that hit later that night! We all remained dry and warm as the rain pummeled down that evening. Today we came up and down the Wildcats! WOW! That was a steep ascent and descent! The critters on the summit of Wildcat Peak A, looking down on Carter Notch Hut. We have a short day today, thank God, and we only summited 5 peaks, Wildcat Peak A-E. Yup! That’s right. Someone got super creative with the naming of these peaks, but I digress. 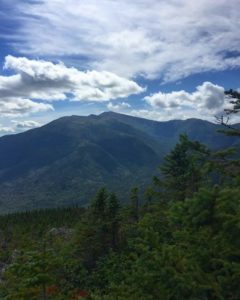 Along our way, we had some gorgeous views of the mountain range across the valley; the Presidentials! 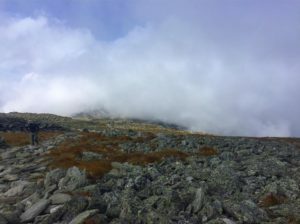 The Presidentials in the clouds. As we continued our traverse across the mountain tops, we came upon a lookout platform. I wonder what that is here for? We took in the gorgeous views, and went to continue on our journey. But which way!? 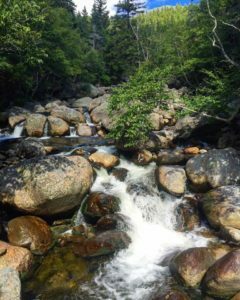 There were several ways we could go, and no sign of any white blazes anywhere. We chose one path, using both my map and my compass, hoping this would be the right trail. Each step we took, brought us closer to a loud banging sound. What on earth is that! As we rounded a corner, something resembling a space ship, emerged from the tree tops until it finally revealed itself. 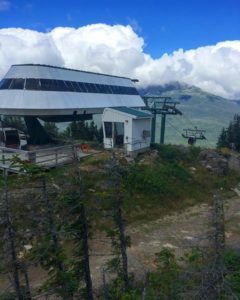 The ski lift on the top of Wildcat Peak D.
Wow! We were at the Wildcat ski slopes. And look! A white blaze emerged from across the top of the slope. We may have taken a small detore, but we were back on the trail. Later that day, we descended the last peak of the Wildcats, and the most difficult. The descent was STEEP and unrelenting. Our knees were sacrificed that day to the mountain gods. 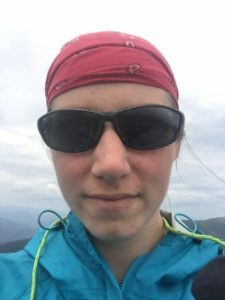 With each pounding step, leaning heavily on my poles to help brace from the impact, I could feel the swelling in my knees increasing and the stiffness setting in. After what felt like an eternity, we finally reached the bottom! But we weren’t done yet! 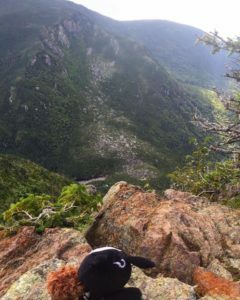 We still had 1 mile to go until we reached Pinkham Notch. Very sore and achy, we took a small snack break before we continued. After joking and eating sweats, helping to pick up our spirits, we rose one more time to don our packs. Stagering to a standing position, knees disapproving every inch of movement, we threw our packs on our backs and slowly pushed forwards. I felt like I had been hit in both knee caps with a baseball bat! 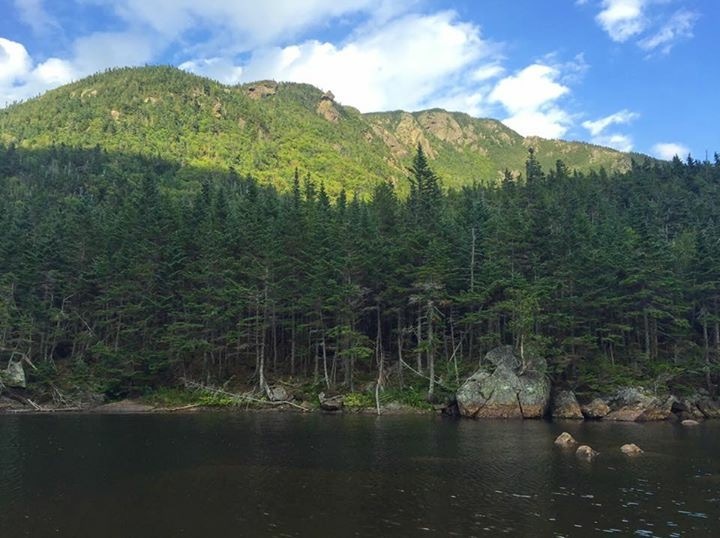 But on we went, until we finally reached our destination; Pinkham Notch, my second home. We checked in, found our room, and eventually made our way to the dining hall for some ice cream and coffee. That’s where we met Red Squirrel and her friend, Iris, two other sectioning SOBOs. What wonderful women! We ate dinner with them that night, getting to know them more, and became friends almost instantly. After full bellies and lighter hearts, we retired to our rooms, a little more refreshed, and ready for Madison Mountain tomorrow! We denied hearing anything about the Lakes of the Clouds Hut, our destination after tonight, where we had planned to try to get our next work-for-stay. She informed us that Lakes of the Clouds Hut had closed due to a bed bugs scare! Yikes! What are we going to do? 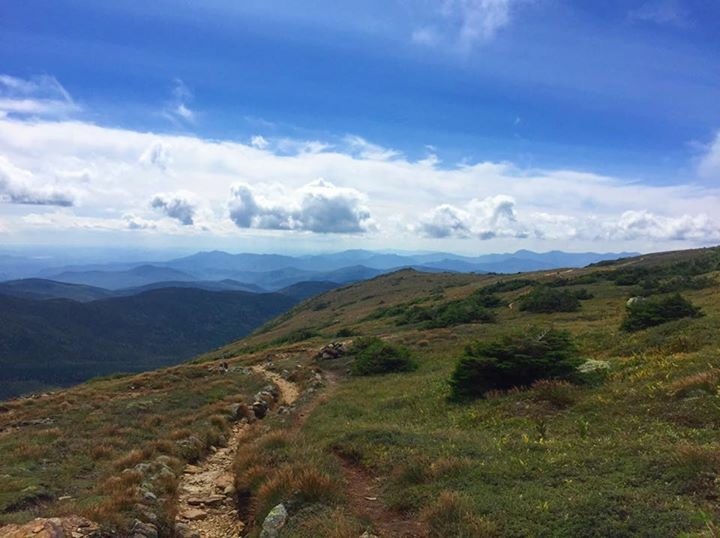 The Presidential Range is notorious for having the worst weather in the world due to Mount Washington, the mountain 1 mile north of the Lakes of the Clouds Hut! We could push on to Mitzpah Hut from Madison Hut, but that would depend on the weather and could be risky! “Don’t yal worry. We have a plan!” Red Squirrel shared her elaborate plan with us, that I must say was quite brilliant. They planned on heading up Madison Mountain today, to stay at Madison Hut. Then the following day they would travers across the ridge to Mount Washington, then take the shuttle down the auto road and stay at Pinkham that night. 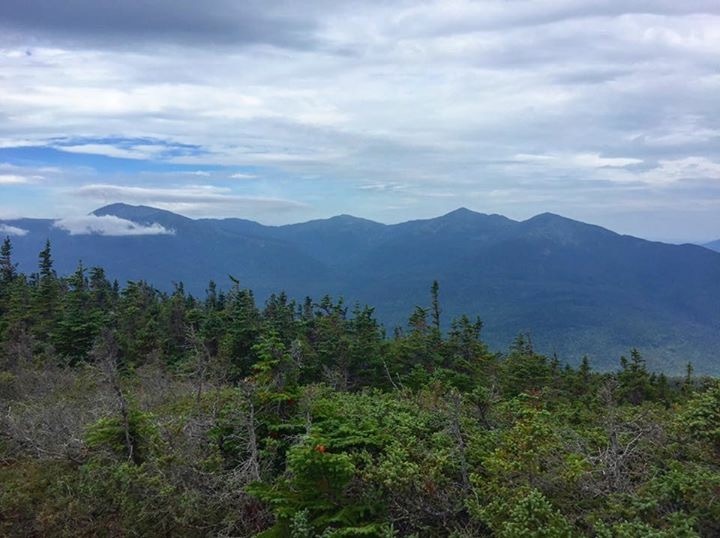 Two days from now, they would then take the shuttle back up the auto road to the top of Mount Washington, and continue on their way heading south. EXCELLENT! We quickly adopted that idea, and made arrangements to stay at Pinkham in two nights time. We returned to our room and removed excess food, placed it in the boxes used for our resupply, and brought it to the main office for them to hold for us for two days from now. Yeay! Not only did we have a plan, but this also meant we were half slack packing up my arch nemisis, Madison Mountain! We didn’t have to carry so much weight! After making all these elaborate arrangements, off we went. Today, we only have to summit one mountain! ONE MOUNTAIN! That’s it! No big deal right! Well, I know better. 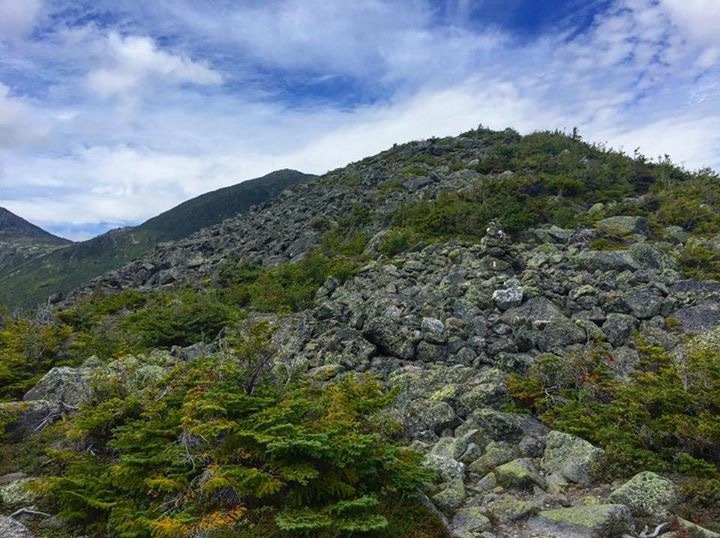 I have hiked up and down this mountain several times before, and it is no easy hike! With it’s steep ascent and several false peaks, ranking at number 3 of 10 on the most difficult sections of the AT scale, this mountain is not to be underestimated. Our long day started with a 3 mile warm up BEFORE the real climb began. Then up, up, up we went! My nemesis, Mt Madison. Stuck in the twilight zone of never ending mountains, up we went. We went up, and up, and up some more. When we thought we couldn’t go up any farther, we went up again! Several of the false peaks we have to summit today. We summited false peak after false peak, the sun beating down on us as we went. As we finally neared the top, we ran back into Red Squireel and Iris, and followed them to the final peak of the mountain. 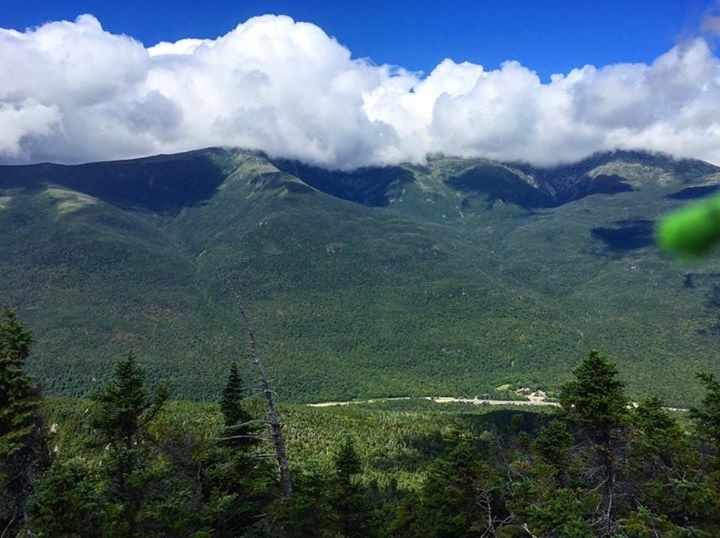 View of Mount Washington from Madison Mountain. After a brief photo opp, and an opportunity to catch our breath from our long ascent, we made it to the hut and checked in as guests. We claimed our bunks, and unloaded our gear, then changed into more comfortable, cleaner clothes, and sat down to drink hot chocolate and play some games. 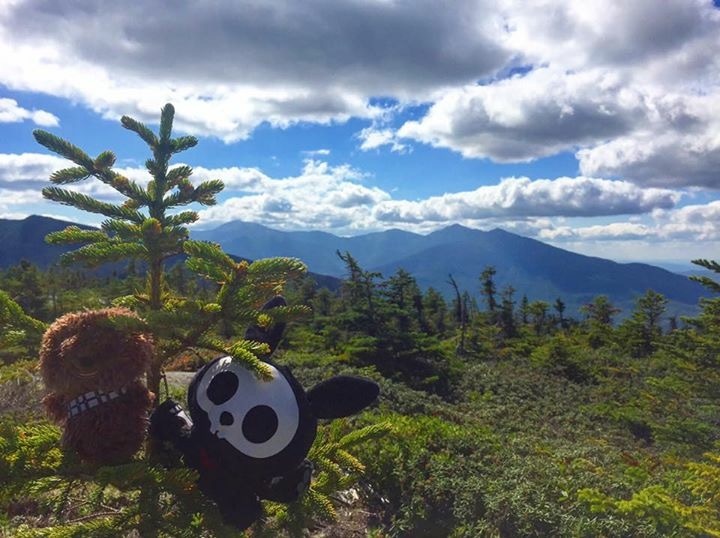 My critters at the top of Madison Mountain, with Red Squirrel in the background. Playing Dominoes with Iris and Free Bird. Don’t let the picture fool you. Free Bird won this game! 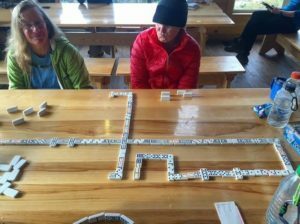 As we played our games, more and more people arrived at Madison Hut. Tonight will be a packed night! Two couples waited, hoping to be able to claim a spot in the hut, however, no such spot ever opened. They would have to stealth camp a little bit away from the hut, below tree line, with what they had with them, which was NOT much! Free Bird and I were very concerned so we offered the equiptment we would not need that night, two sleeping pads and Free Bird’s rain pants and buff, to help keep them warm. They thanked us profusely and off they went to brave the night. The weather was supposed to be good tonight and the following morning. We would spend the rest of the night worrying about them! Tomorrow, we go across the ridge, completely exposed the entire way, and hope that the mountain allows us to pass. The weather can change so fast, and be so unforgiving. Let’s hope it holds out! The weather report is not looking good for today. They are calling for thundershowers in the afternoon, but this morning is supposed to be cloudy and dry. 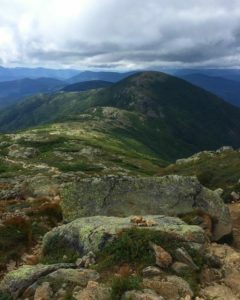 So after some discussion, Free Bird and I decided we would race across the ridge towards Mount Washington and catch the shuttle down. Red Squirrel and Iris, however, decided they would take an alternate route down, concerned they would not make it to Mount Washington before the storms began. We will see them again at Pinkham Notch, later tonight. As we packed our gear, getting ready to leave, we had one thing on our minds; the two couples that braved the weather and tented somewhere outside Madison Hut! Did they survive the night? Did they stay dry? Early this morning, the winds picked up and the rain began. Was their tent good enough to keep them dry? 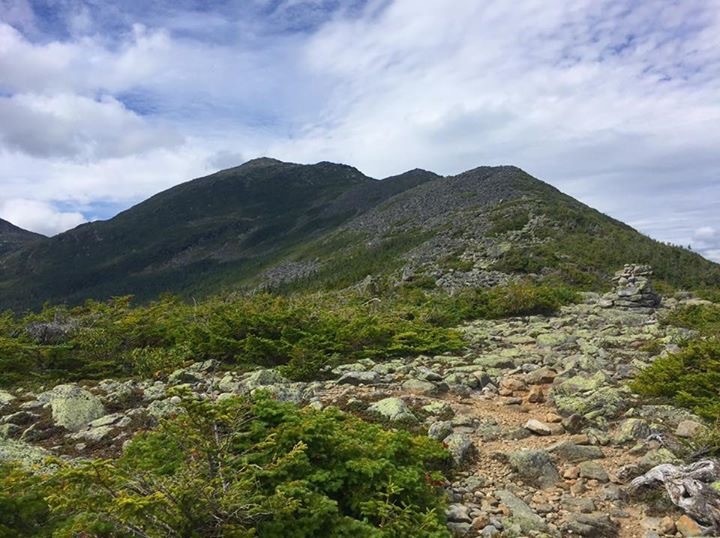 I finally couldn’t take the questions spinning in my brain any longer, and having hiked this mountain range since I was a young girl, I hiked down the trail to search for their tent. As I approached where I thought they may have been, I looked around. No sign of any tents. Surely, they did not go OVER the ridge to tent! That trail drops straight down! 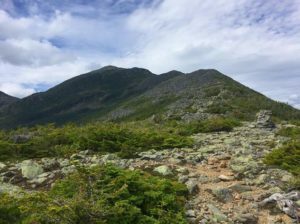 With no sign of the couples, I was left with hoping the rain woke them early this morning, they packed up, and headed down to Pinkham Notch. We should be able to see them there and collect the items we lent them. I really hope they are ok. I came back to the hut with no information on the couples and Free Bird and I readied ourselves to press on. Now I was worried about Free Bird as well since her rain pants and buff were with the couple. I hoped she did not get too cold as we braved the bad weather. Just as we were saying our goodbyes to Red Squirrel and Iris, in came the couple! I was elated to seem them! They had stayed dry and warm and remained safe that evening! I couldn’t believe it! They had gone over the ridge, but not far. I was overly thankful that they were ok and we embraced after we repacked our bags and stepped out into the gray to traverse across the ridge. We were the only ones heading in that direction that morning. 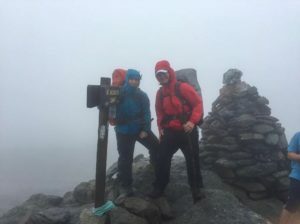 The winds were not bad, and the rain was light, but the visibility was low. The Presidentials were welcoming me home with a mild version of the weather I grew up with in this region. 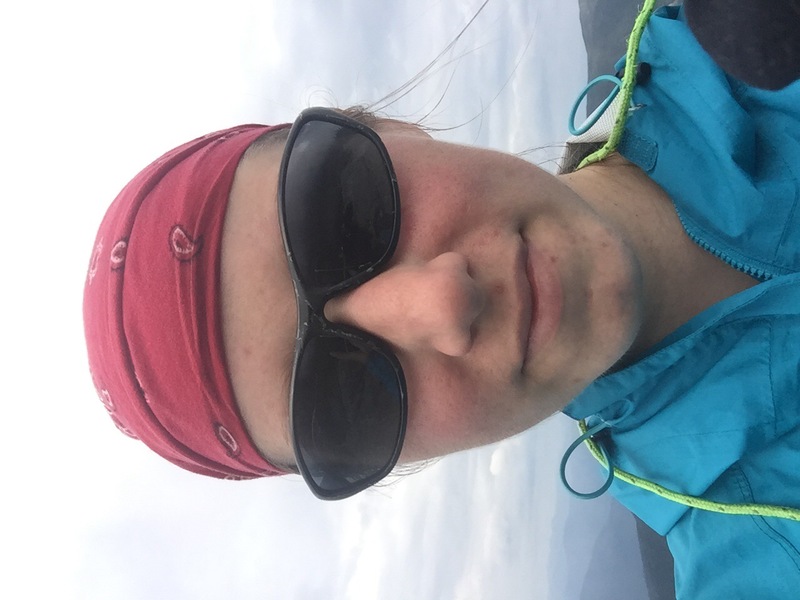 As we crossed Mount Adams, the winds picked up and the rain pelted us in the side of the face. After a while, the rain started to hurt. Is this rain or hail? We were not sure. It was warm enough but the rain was deafening and painful! As we continued on, one mantra entered my mind; a mantra I would repeat the rest of the day. 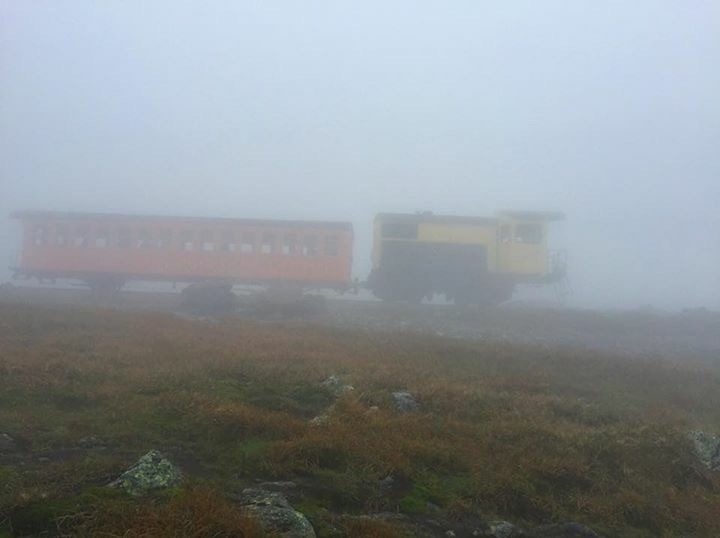 Please let us get safely to the top of Mount Washington. If the weather got much worse, we would have to find somewhere to take cover and hunker down, but not yet. As we continued on, we saw a few small groups of people heading the other direction. Looks of shock and disbelief on their faces as we pressed on towards Mount Washington. Some wishing us the best of luck, clearly disagreeing with our decision to press on. Step by careful step we continued on. 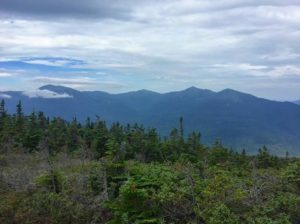 Slowly, the winds grew quieter, the rain softened, and the clouds began to blow across the ridge, occasionally showing us glimpses of the mountains and multiple layers of clouds around us. The weather was improving! Mother Nature was hearing my mantra and granting us passage to Mount Washington! Each step, each boulder, I continued this mantra in my head, fearful that if I stopped, Mother Natures wrath would return and blow us of the mountain. Slowly, the sound of a chugging engine and cry of a horn whispered through the blowing wind. We were getting closer to the Cog railway, the train that goes up to the top of Mount Washington! Never did we slow or break. We kept our pace up, as fast as we could without risking a nasty slip. The Cog became louder until, suddenly, it appeared through the fog. We stopped, taking a moment to wave at the dry and warm passengers, pearing at us through their windows, waving back. Once the train passed, on we went. The top must be getting close! As the trail continued on, it gradually decreased in steepness, and I knew I had reached the top. But where were the buildings I knew lived on the top of Mount Washington. They must be here somewhere. I creaped along the top of the mountain, arms out in front of me, waiting for the buildlings to emerge. One after another, slowly they presented themsevles through the fog. We had safely arrived at our desination. We took a brief picture on the very top of the mountain before we retreated into the conservatory to warm up and dry off. As we hung our clothes to dry, 4 young hikers walked into the locker room. They were brother and sisters, 4 thru-hikers ranging from the ages of 12-17! Their mother, Big Mama, was supporting them by car, picking them up at each town and helping them with resupplies. Unbeleivable! How amazing to have an entire family, that young, to be accomplishing something so big! Once dry and warm, with hot chocolate in our bellies, we bought ourselves tickets for the shuttle down. We had until 1pm to look around at the museam and other sites. So I took Free Bird on a short tour of the mountain top from the safety and comfort within the walls of this fortrous. By 1:15pm, we were in the shuttle and on our way down. Today was complete. The drive down was spectacular as the shuttle dropped below the clouds. Beautiful! We laughed and caught up, each telling our stories of our travels down the mountain. Red Squirrel and Iris informed us that sadly, they had decided they would be heading home tomorrow. They had scheduled a flight and were done with the Whites for now. We were sad to hear they were done, but understood. We would at least be able to have breakfast with them the following morning. A warm shower, dry clothes and full stomaches later, we snuggled into bed and called it a night. Tomorrow, we ride back up the auto road to continue our journey through the Whites! 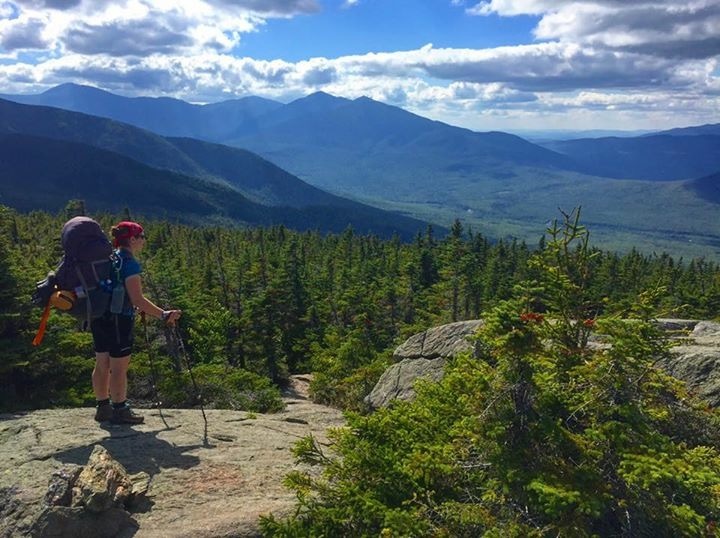 Since we had officially completed the four hardest sections of the AT, Katahdin, Washington, Mahoosuc Notch, and Madison, I informed Free Bird that it was now ok to tell me how much my pack had weighed. Weeks prior, she had weighed my pack and kept the number secret at my request. 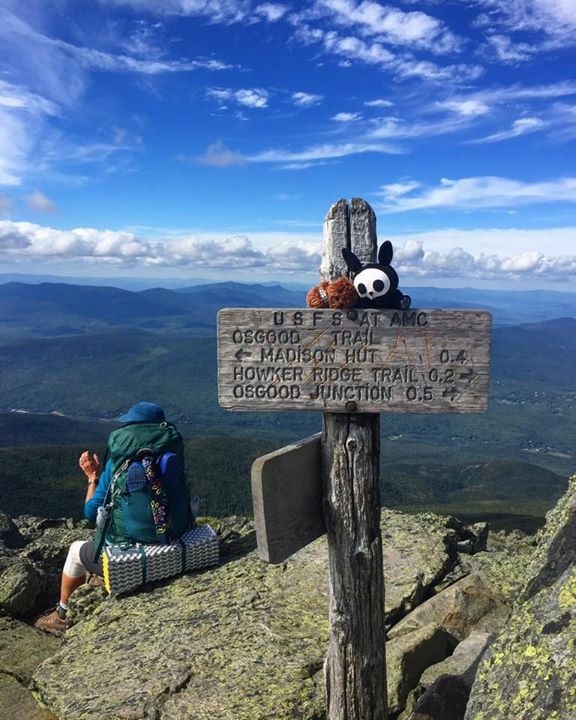 I was afraid that if I knew the true weight of my pack before tackling Mount Washington, that mentally, I would be defeated. So, now down Mount Washington, I allowed her to give me that number; my pack weighed between 52-55 pounds! Yup, I thought so! Well, at least now I know! This morning, we joined Red Squirrel and Iris for breakfast. We chatted and wished each other good luck on our travels, them with their plane flight, and us with our continued journey. We embraced and went our seperate ways, knowing we would see each other again soon! As Free Bird and I exited the buildling, getting ready to pack our stuff to be ready to head back up to Washington, up walked Weelbes and Tree! What an excellent surprise! Weebles would be leaving soon to spend some time with family close by. Tree was simply dropping off some supplies for himself to be picked up when he arrives a few days later. Big hugs went all around as we chatted and caught up. 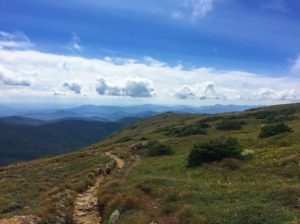 We certainly did not expect to run into Tree again, thinking by the time he got close to catching us, he would be completing this part of his journey on the AT and heading home. After a while, Free Bird and I realized our time was running short; our shuttle would be there to pick us up soon. So we once again said farewell to our friends, this time expecting to hopefully see them again soon, and retreated to our rooms to pack quickly. The shuttle arrived on time, and brought us back to the top of Mount Washington. Today, the weather report is looking great! We should have some great views! Once we arrived at the top, off we went, along our way, heading for Mitzpah hut. 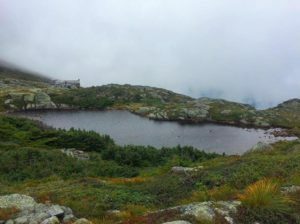 We quickly made it down Mount Washington and arrived at my favorite hut, Lakes of the Clouds. They were now open again, after recognizing that the beg bug scare was just a scare. So we went in and had a snack and some hot chocolate. The clouds rolling accross the mountain ridge. 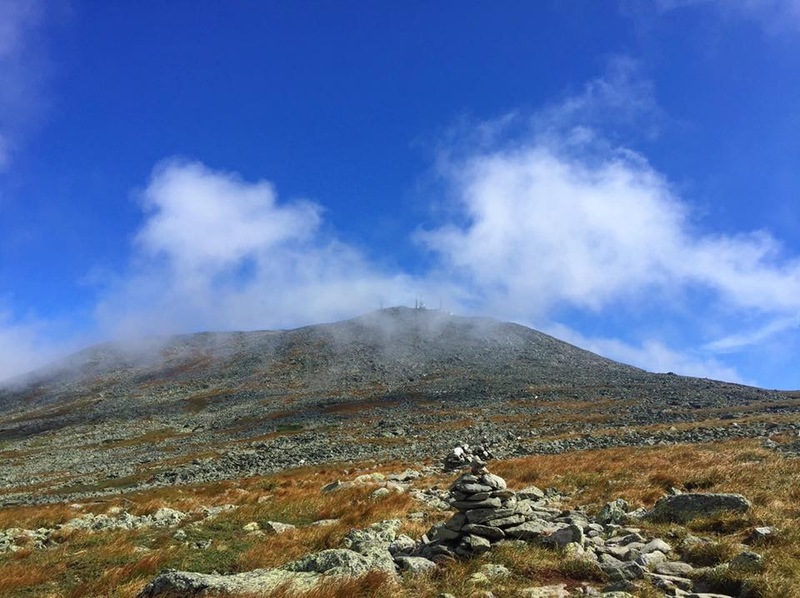 Mount Washington emerges from the clouds. After a brief rest, we continued on. The clouds remained scarse and the views were gogeous. Finally, we arrived at the last mountain before Mitzpah Hut; Mount Pierce. Two very happy golden retreivers were waiting to great us as we creasted the mountain peak. After spending some time with the happy puppies, my critters came out of the pack for a photo opp on this summit! The critters summit Mt Pierce. After a short hike down, we arrived at Mitzpah Hut. Close to Mitzpah is the Nauman Tentsite, where we claimed a spot and set up our tents. Tomorrow, we cross Crawford Notch and press on towards Franconia Notch, where my Uncle will pick us up and allow us to stay with him for a few days. I CAN’T WAIT! We have now completed the top 4 most difficult sections of the AT! Everyone tells us once we have left the Whites, the terrain improves and we should be able to pick up the pace. 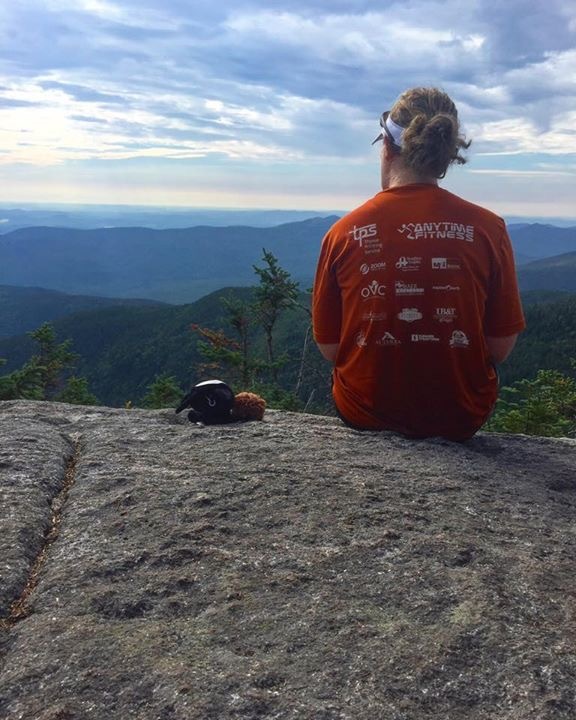 We still have Franconia Notch, the Kinsmans, and Moosilauke Mountain to contend with, but we are getting close! Before we know it, we will be entering into Vermont! Here we go! Thanks for continuing to follow along on our journeys, and . . .
That’s incredible! Was it at least a little comforting that you knew what the Whites entailed before you set out for them verses being unware? Hey Diamond. It was daunting at first, knowing the trail leading to Madison Hut. But I was pleasantly surprised that it was much easier for me this time round! The rest of the Whites were exactly what I expected. But I love them so it was a blast! Thanks for commenting and I hope you continue to enjoy my adventures! Loved your account of your adventures as well as all the great photos! I especially enjoyed reading about your stay at Carter Notch Hit and the flip flippers who joined you there doing work for stay. You see, I’m Library’s mom and it was fun to get an unexpected glimpse of his adventure!! Thanks for the post. Hello Denise! That’s excellent! That makes me so happy to know that someone recognized someone I mentioned in my blog! That is exactly why I do my best to catch names of people and document who we come across! It was fantastic getting to do a work-for-stay with your son. He was an excellent person and my trailmate and I are hoping to see him and his two friends, Captain Planet and Rainbow when they flip back to Connecticut again! You’ll have to tell him Dori and Free Bird say hi! Thanks for enjoying my adventures with me!